I got a little injection of funds the other day, the emphasis being on the little, but just enough to enable me to dip my toes back into the book-buying pond. Consequently, I snapped up Liberties and Communities in Medieval England, a collection of essays by historian Helen Cam published back in 1963, which had been recommended to me by Dennis Turner as a work of potential relevance to research on explaining the origins of Surrey as a territory and polity. Turns out I could have saved my money as most of the volume is on Google Books. However, among the pages that are omitted online is one of some relevance to the latter part of my Guildford Park note. 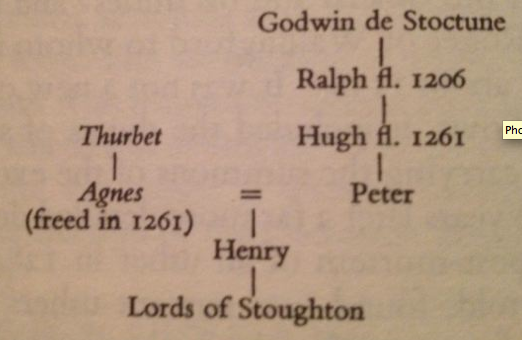 It concerns the earliest stages of the family tree of the Stoughtons of Stoughton as recorded by a seventeenth-century descendant, the antiquarian Sir Nicholas Stoughton. I’ve included a picture of it below as it’s far too late for me to be copying out family trees (hence the little yellow box from the cursor intruding into its right-hand side). I’m fairly certain no-one will be too fussed about copyright issues, nevertheless I would like to stress that I mean no ill by using the following photograph without permission. What the above shows is that the family – and more importantly the place from which they took their name – was in existence before 1200. As such, it accommodates my hypothesis that Stoughton could and did not come into existence until after the southward shift of the royal hunting ground from the ?haga of Stoke to Guildford Park sometime during the twelfth century. Truth be told, I’m not so sure of the robustness of that contention now, but I’ll leave it for others to shoot it down or substantiate it. I’m turning in for the night. Helen Cam, ‘Pedigrees of Villeins and Freemen in the Thirteenth Century’, in Liberties & Communities in Medieval England: Collected Studies in Local Administration and Topography (London: Merlin, 1963), 124-35.